This is my first productive application in C#. 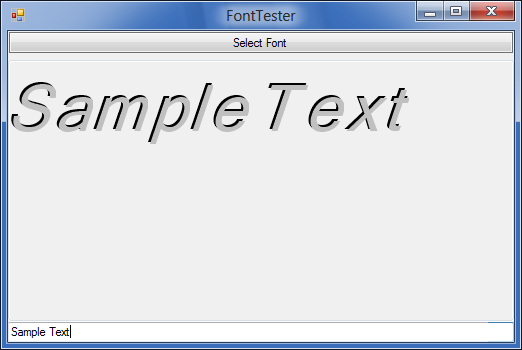 It allows to export specific truetype font into a folder with different colors and sizes as bitmaps. Exports the selected glyphs in PNG format so that they can be used in OpenGL games. Here's the screen shot. file, you need to use it as XML. Here's the structure of the file. tags in the font tag with the following attributes. data="....Base64 encoded PNG image here..."
The XML files have no indentation which is included in this sample. When using in C#, you can use the pre-made FontPack library available in the git and in binaries. Sounds neat -- I am working on a similar tool at the moment. What does it export to? Any common formats like AngelCodeFont? Does it pack the bitmaps into a texture atlas? Yes I'm going to make this open source. I'll git it when I had my first productive version without any glitches, probably this afternoon. I'll use XML to describe the font the same contains the glyphs. Here's a sample XML file. Now, this can export into XML and also can load them. Now added the binaries. These are compatible with Mono 2 and more. Had to write the loader for LWJGL. Does it output kerning information too? @princec Can you clarify what is kerning? The separation between letters. For text to look balanced, you don't want the same advance between every pair of letters. and trimming the image so that they have only the visible character and no empty space between characters. You can see that in the screen shot. Kerning tells you how closely you're meant to place those images next to each other, it's how you get nicely rendered fonts. It's not about the width of the characters as much as its about the gap you're meant to place between any given pair of characters. Look at your first screenshot: Sample Text. Use the font you exported there to draw Sample Text, and I bet that you will introduce a massive gap between the l and e of Sample, and between the T and e of Text. Thanks for mentioning. This test proved it. I don't know why the letters are moved up. Can you point me a tutorial on how to use kerning? Is the Window supposed to be slightly transparent? I find it kind of distracting. The .exe file runs perfectly on Mono on Fedora 19 64-bit. Managed to fix the bug in which the letters go up sometimes. Here's the new screenshot. Glad that it's working on mono. Thanks for testing. That transparency is due to me setting the form's opacity to 95%. I don't know any. You could start by looking at the Wikipedia page (and maybe browsing some of the other pages in the Typography category). 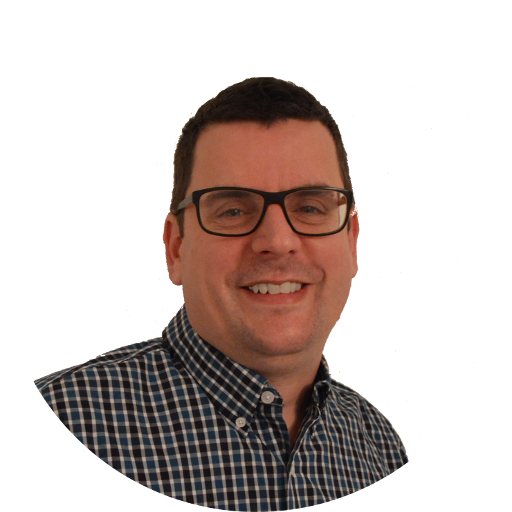 How are you parsing TTF information? Most frameworks offer some sort of kerning data along with the glyph size. - For LWJGL applications, it's usually desirable to have a single image (PNG or other format) that holds all glyphs. This way we can take advantage of texture atlases which improves sprite batching. Right now it seems like each glyph holds RGBA data, which seems useful for a CPU-based renderer, but would involve a bit more work for a GPU-based renderer (i.e. packing into a texture). You can look into Black Pawn packing algorithm for a fast and easy to implement texture packer. Or you can look into a tool like TexturePacker2. - What's up with the transparency? It looks a bit choppy around the edges and doesn't seem to blend well with the background. encoded string into the XML file. For the choppy images, I haven't yet turned on Anti-Aliasing and so the effect. I'll enable it once when I learnt about kerning. That problem exists only with fonts with Italic style. Here's the screenshot with normal font. Added Anti-Aliasing and it's even looking smoother now. The only way to easily calculate kerning using normal Java APIs is to draw every pair of letters next to each other and see how the advance between them differs from the normal advance. For any difference != 0.0, that's the kerning for that pair of letters. to get the kerning information. This is what I'm using for my own font packing tool. Since this is a C# project, I guess that doesn't really apply. The problem is appearing for Oblique/Italic fonts. See The only error in this screenshot of "Microsoft Sans Serif" is in the word "Text"
I'm browsing the MSDN "How to Obtain Font Metrics" and here's the image they've shown. native function gives how much should we advance after rendering that character but I can't find one that is purely cross platform. Here's another screenshot of the font "Mistral"
I've noticed some small gaps between the letters in the bitmap version. However some of these script fonts are rendering nice. Didn't I just tell you how to do it? @princec Actually I didn't understand. Can you provide me with an example? No, all of the letters in Sample are too widely spaced. They may be consistent, but that doesn't make them correct. Actually I didn't understand. Can you provide me with an example? Now I'm just advancing the width of only one char but not the other on top of it. Thanks. Now I'll try this. I didn't completely understand that formula but using that for every char pair gives value -33. How can I fix it? I have a class here (part of Hiero) that can read kerning from a TTF file. I use some reflection magic here to try to get the TTF file on Sun VMs if all you have is an AWT Font instance. 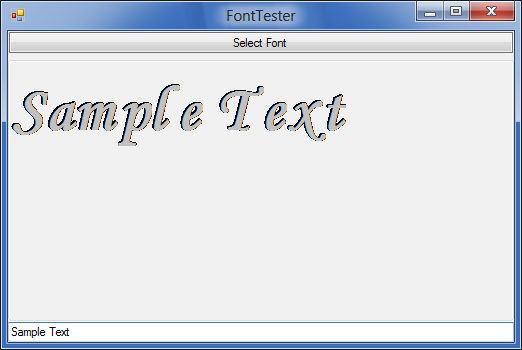 I wrote this article about the various tools for generating bitmap fonts. We can add your tool if you like. 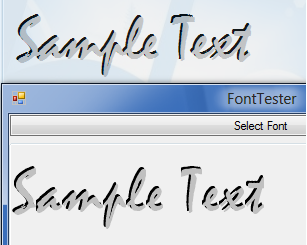 As I wrote there, the BMFont tool does the best job due to supersampling with FreeType, especially at small sizes. I wish Hiero could do this. 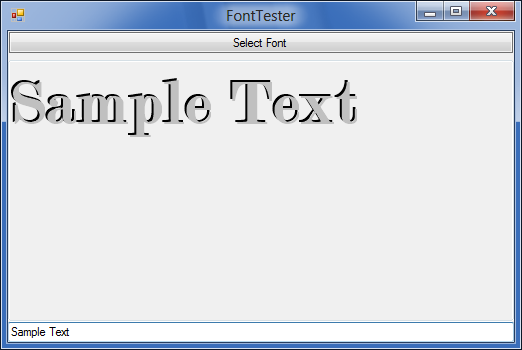 Hiero4 in gdx-tools is a prototype for a FreeType based tool using MatthiasM's font renderer he made for TWL. It works but isn't really finished and doesn't do supersampling. Also it means no effects, though that can be done in Photoshop if padding is added to the glyphs.